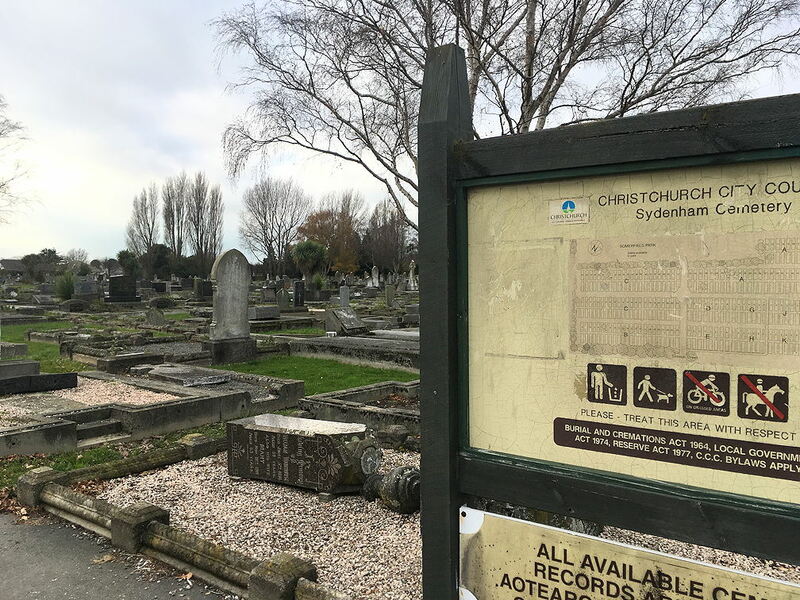 While I was in Christchurch last June for the NZSG conference, I was determined to finally discover the resting place of my 2 x great grandfather, Martin Burke. (There’s a picture of Martin in an earlier blog post.) My first attempt with my aunt back in 2012 was not successful. From Christchurch City Council’s cemetery database I knew he was buried in Sydenham Cemetery on 28th November 1918, and I had a plot number, but no map of the cemetery. Major fail. This time I had both! However, it still wasn’t that easy to pinpoint his actual burial site. 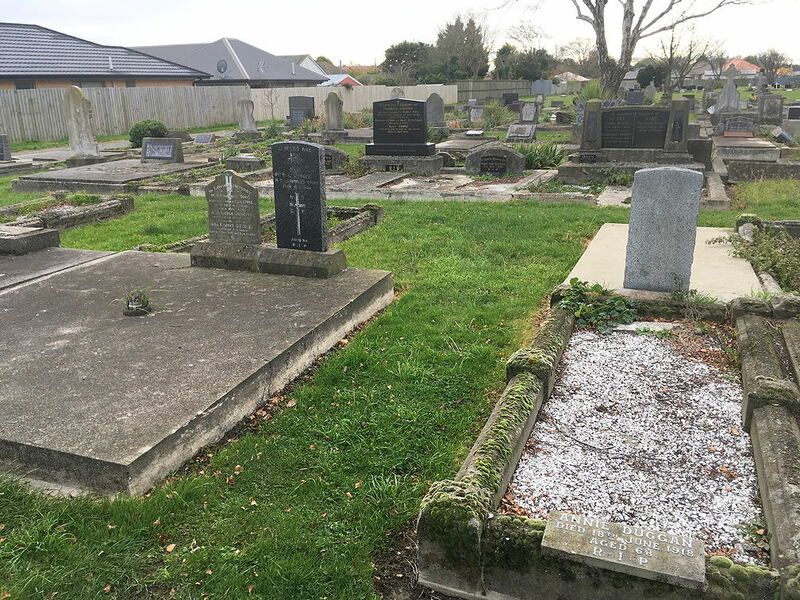 While I could find the right block and row, none of the graves were numbered, so it was a case of using my phone and the online database to work out who was buried where, and narrow down his exact burial spot. And what my aunt had thought was a walkway, was in fact our ancestor’s grave. Later that weekend, I met up with a Burke cousin at the conference, and they were also going to search for Martin’s grave. However, they had been in contact with the council and had a plan with the names and gravesite numbers marked on it. Smart! We’re not sure why Martin doesn’t have a headstone on his grave. Perhaps there was no money for a memorial, or some ill feeling amongst the family. At least we now know where he rests. 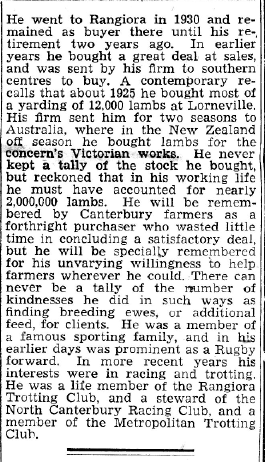 Some of the details in this obituary seem slightly out – like when he was transferred and to where, doesn’t seem to tally with other information I have. I think it will be helpful to work out a timeline of his life, see how everything fits in. There’s no mention of any family, or other personal details, which is a bit disappointing. I’m intrigued by the referral to his “famous sporting family”. What’s that all about? Something else to investigate! 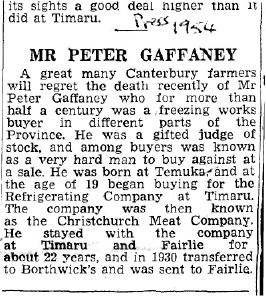 “Mr Peter Gaffaney”, The Press, Christchuch, 1954; digital image, scan from Gaffaney family papers, 2006, supplied by [NAME AND ADDRESS FOR PRIVATE USE]; original privately held by [NAME AND ADDRESS FOR PRIVATE USE].